On Wednesday 3 April 2019, a group of lawmakers, led by Senators Marco Rubio and Bob Menendez, and Representatives James P. McGovern and Chris Smith, asked President Trump and his office to take solid actions against human rights abuses in Xinjiang. They asked for the application of the Global Magnitsky Act, a previous US measure taken against human rights abuses in Putin’s regime. A group of U.S. lawmakers on Wednesday urged the Trump administration to impose sanctions against Chinese officials deemed responsible for human rights violations in northwest China’s Xinjiang Uyghur Autonomous Region (XUAR), saying Washington has failed to act strongly enough. The lawmakers—led by Senators Marco Rubio and Bob Menendez, and Representatives James P. McGovern and Chris Smith—called for the swift imposition of Global Magnitsky Act sanctions on XUAR Party Secretary Chen Quanguo and other Chinese officials “complicit in gross human rights abuses” against ethnic Uyghurs and other Muslim minorities in the region. They also called on the Commerce Department to strengthen export controls to ensure U.S. companies are not assisting the Chinese government in creating civilian surveillance or predictive policing systems used by authorities in the XUAR. The U.S. should establish strengthened disclosure requirements to alert American investors about the presence of Chinese enterprises that pose national security dangers or are complicit in human rights abuses, in the U.S. capital markets, they said. “Americans would likely be very troubled, if not outraged, to learn that their retirement and other investment dollars are funding Chinese companies with links to the Chinese government’s security apparatus and malevolent behavior—links that represent material, asymmetric risks to corporate reputation and share value,” the letter read. 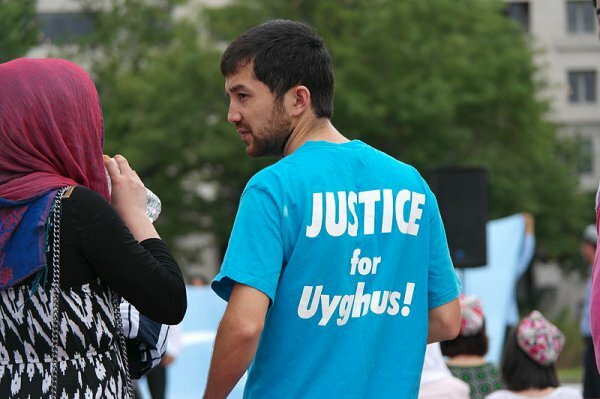 Beginning in April 2017, Chen established a network of political “re-education camps” in the XUAR that have since held up to 1.5 million Uyghurs and other Muslim ethnic minorities accused of harboring “strong religious views” and “politically incorrect” ideas. In Wednesday’s letter, the lawmakers noted that despite the Chinese government’s “obfuscations and slanderous attacks on critics of its abusive policies,” the international community is increasingly concerned about Beijing’s treatment of its minority groups in the XUAR, which they said include human rights abuses that may constitute crimes against humanity. “We are disappointed with the Administration’s failure so far to impose any sanctions related to the ongoing systemic and egregious human rights abuses in Xinjiang,” the letter said. The lawmakers requested details of U.S. efforts to address rights abuses in the XUAR, a list of visits requested by U.S. officials to the region and requests to investigate the camps, and a description of diplomatic efforts to account for detained U.S. legal residents and family members of U.S. citizens, as well as the names of any American companies that have sold technology to Chinese firms operating in the region. They also called for an outline of what specific steps are being taken by the U.S. government to prevent the Chinese government from using American-made goods and services to perpetrate rights abuses in the XUAR, what diplomatic engagement the State Department has undertaken with like-minded partners on the issue, and what types of actions are planned at the United Nations to raise the profile of the crisis.